Lots of beef and veg here. The steak is chewy, but that usually means it’s actual steak and not some chopped-and-formed beef-and-soy-protein product. The potatoes are not roasty-tasting; I was actually craving the crushed potatoes from the other two meals in pots but I suppose they have to mix it up a bit. The gravy is very thyme-forward with a slight bitterness from the Dorset ale. 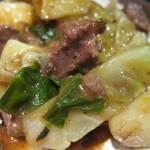 For a meal containing beef it’s very low in fat and calories. 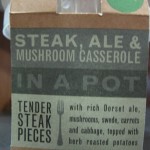 It’s a tasty meal but not significantly different from other steak and ale casseroles and doesn’t showcase the “in a pot” concept like the other two meals I’ve reviewed.